Copyright Week provides a timely opportunity to reflect on Communia’s mission to preserve the public domain and our common heritage against copyright extension, misleading attempts to privatize public domain works, the shrinking of users’ rights, and the general trend in extending the scope of copyright in ways detrimental to the production of culture and knowledge. This policy paper proposes to contribute to defining a positive agenda for the Public Domain. It is grounded on a WIPO study by Professor Séverine Dusollier, Communia policy recommendations and Communia previous WIPO statements. This work-in-progress document presents policy recommendations and strategies aimed at the transnational level, namely WIPO CDIP and SCCR. Legal language will be drafted at a later stage. The full policy paper can be downloaded as a pdf: Communia Positive Agenda for the Public Domain and the full text is also available below/after the jump. This statement on the Terms of Reference for a Comparative Study on Copyright Relinquishment by the WIPO Secretariat (CDIP/10/14) is following Communia’s previous statements delivered at CDIP/8 and CDIP/9 supporting the Scoping Study on Copyright and Related Rights and the Public Domain by Séverine Dusollier (document CDIP/7/INF/2) and the Scenarios and Possible Options Concerning Recommendations 1c, 1f and 2a of the Scoping Study on Copyright and Related Rights and the Public Domain by the Secretariat (document CDIP/9/INF/2). COMMUNIA International Association on the Public Domain welcomes the document produced by the WIPO Secretariat in preparation for the tenth session of the Committee on Development and Intellectual Property (CDIP) titled Terms of Reference for a Comparative Study on Copyright Relinquishment (CDIP/10/14). We believe that this document is an encouraging sign for copyright international law-making to commit itself to considering crucial aspects of access to culture and knowledge in recognising the increasing importance of the Public Domain, on the basis of the WIPO Development Agenda Recommendation #16: “Consider the preservation of the public domain within WIPO’s normative processes and deepen the analysis of the implications and benefits of a rich and accessible public domain”. 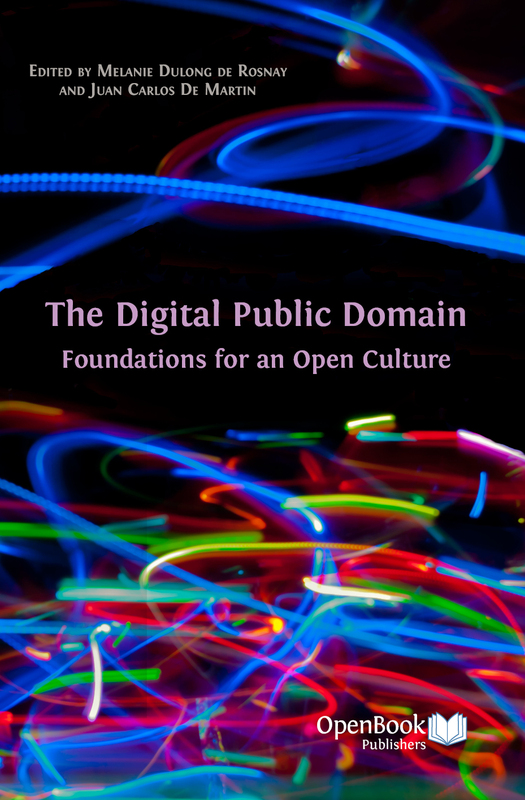 On Monday, June 18, MEP Amelia Andersdotter, along with her colleague MEP Ioannis Tsoukalas, is inviting you to attend the launch of the book ”The Digital Public Domain: Foundations for an Open Culture”, edited by Melanie Dulong de Rosnay and Juan Carlos De Martin as an output of the Communia Thematic Network. The book is under a CC Attribution license and the PDF can be downloaded here. If would like to attend the event and require access to the Parliament, please register with amelia.andersdotter-office@europarl.europa.eu before June 14, indicating your full name, date of birth and ID number. More information on the book can be found on the Communia Association’s website. Link to the invitation on Amelia Andersdotter’s blog. Edit on 14 July 2012: a video interview of Anne-Catherine Lorrain, Juan Carlos De Martin and Melanie Dulong de Rosnay during the book launch event is available on YouTube. Thanks to Amelia Andersdotter’s team members Julia Reda, Edvinas Pauza and Tess Lindholm. 1.c. The voluntary relinquishment of copyright in works and dedication to the public domain should be recognised as a legitimate exercise of authorship and copyright exclusivity, to the extent permitted by national laws (possibly excluding any abandonment of moral rights) and upon the condition of a formally expressed, informed and free consent of the author. Further research could certainly be carried out on that point. 1.f. International endeavours should be devoted to developing technical or informational tools to identify the contents of the public domain, particularly as far as the duration of copyright is concerned. Such tools can be data collections on works, databases of public domain works, or public domain calculators. International cross-operation and cross-referencing of such tools is of particular importance. 2.a. The availability of the public domain should be enhanced, notably through cooperation with cultural heritage institutions and UNESCO (through its work on the preservation of intangible cultural heritage). The book “The Digital Public Domain: Foundations for an Open Culture”, edited by Melanie Dulong de Rosnay and Juan Carlos De Martin as an output of the Communia Thematic Network which took place between 2007 and 2011 and is at the origin of Communia Association, is out in all formats (hardback, paperback, and digital editions) and can be purchased on the website of OpenBookPublishers. Citation reference: Melanie Dulong de Rosnay, Juan Carlos De Martin, (eds. 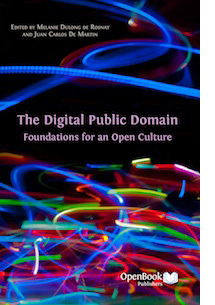 ), The Digital Public Domain: Foundations for an Open Culture, Open Book Publishers, Cambridge, UK, 2012, 220 p.
This book brings together essays by academics, librarians, entrepreneurs, activists and policy makers, who were all part of the EU-funded Communia project. Together the authors argue that the Public Domain — that is, the informational works owned by all of us, be that literature, music, the output of scientific research, educational material or public sector information — is fundamental to a healthy society. Creative Commons France organizes with Wikimedia France, the CNRS Institute for Communication Science and the Open Knowledge Foundation a public domain day in Paris, with members of organizations partnering for this event, Philippe Aigrain and Jérémie Zimmermann of la Quadrature du Net, Rémi Mathis of Wikimedia France, Lionel Maurel @calimaq and Tangui Morlier of Regards Citoyens. The Scoping Study on Copyright and Related Rights and the Public Domain by Séverine Dusollier (document CDIP/7/INF/2) has been discussed at WIPO CDIP/8 (Committee on Development and Intellectual Property). WIPO secretariat will prepare a document to provide more information on three of the recommendations contained in the study (namely recommendations 1.c., 1.f. and 2.a.) proposing to lead further research on the legitimacy of tools such as CC0 dedicating works to the public domain, the development of tools identifying public domain works, being databases of calculators and cooperation with cultural heritage institutions and UNESCO to enhance the availability of public domain works. “I would like to present a statement on behalf of the Civil Society Coalition and COMMUNIA international association on the digital public domain and take the opportunity to thank the secretariat for all the efforts led since years to lead a study on the public domain. As this is the first time I take the floor, I would like to also thank the chair for this opportunity and briefly introduce our work. COMMUNIA has been funded by the European Commission between 2007 and 2011 and recently incorporated as an international organization under Belgian law. The most emblematic output of COMMUNIA is the Public Domain Manifesto, which was translated in over twenty languages and signed by several thousands individuals and a few hundreds associations worldwide. The author of the study under discussion was a member of the thematic network and we welcome very warmly all of its recommendations. A vibrant, positively defined public domain is of vital importance for the international copyright framework and for the Development Agenda as set up by the Recommendations in particular from Cluster B recommendations 16 and 20. (b) cultural sector organisations and memory institutions are holding vast amounts of Public Domain material which they cannot use without a clear understanding of the Public Domain boundaries. For these reasons, we believe CDIP is the right forum to discuss this study and all of its recommendations.